An early bustout from Encore’s double guarantee last night, but three odd hands. I was in HJ with 7x9x at the 50/100 level and was just about to throw it away when I dropped one of the black chips in after a couple of other limpers. BTN raised to 400, BB called, and everyone else dropped out but me. The flop was three hearts, including 6♥8♥. We checked it around, and a low non-heart hit the turn. BB fired out 1,100, which got called by myself and BTN. 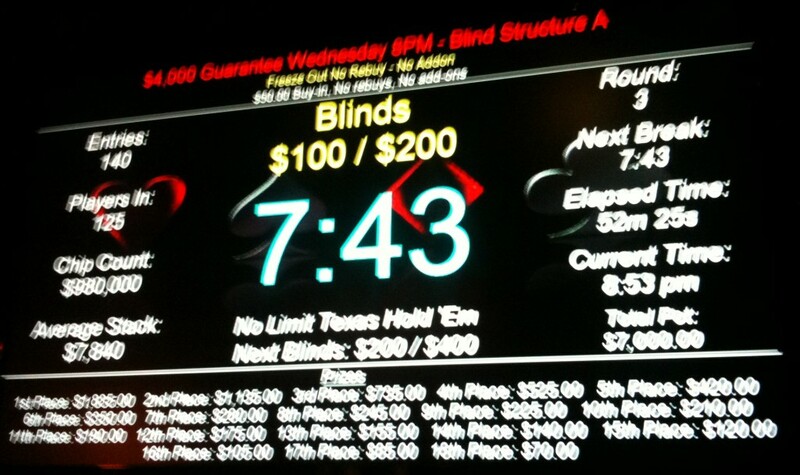 5x on the river completed my straight, and I called an all-in from BB, who showed AxAx, neither of which was a heart. Fortunately for him, I’d already lost a pot. A little bit later, I opened to 400 with K♣Q♣. Needless to say, the flop was K♥Q♥T♥. What can you do? I played it down to the river calling bets and lost to the flopped straight and royal flush redraw of J♥9x. Way behind there. My last hand hurt. Normally, 10-handed, I wouldn’t look twice at a low pair, but the cost was still only 200. 6x6x and I was in middle position. The flop was once again three hearts, including 6♥. He jammed about 5K into the pot all-in, I called for a little less, and he flipped over kings. I don’t remember if he had K♥, but even if he did, I was in reasonably good shape. That is, until a king showed on the turn. Then I was in sucky shape. Thirty minutes (came in near the end of round 1). 126th of 140 entries.